Interview, the pretty magazine in which pretty famous people have conversations with other pretty famous people, has released their newest issue, and it’s all about #ME. Well, not me me, but celebrities me. So, them. It’s about them. 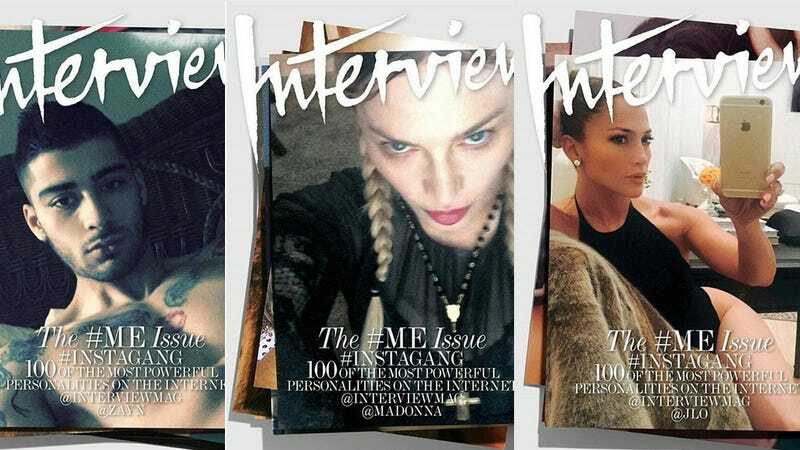 The September issue features eight “alternative covers that are essentially self portraits of some of today’s most popular social media celebs,” from Madonna to Zayn Malik. Collectively, they form the magazine’s #Instagang. The magazine [has created] an Instagram-themed issue featuring eight alternative covers that are essentially self portraits of some of today’s most popular social media celebs. “We wanted to see how they see themselves and how they want to be seen,” you say? That, my friend, is what celebrity Instagram users do countless times per day. If I want to see how Madonna sees herself, I check her Instagram. If I want to see how Selena Gomez sees herself, I check her Instagram. If I want to see how Kim Kardashian sees herself, I make a pot of tea, turn down the lights, hop on the couch, wrap myself in a blanket, and flip through my copy of Selfish for the nth time. Interview will “roll out images over the course of the month on its Instagram account.” If, however, you prefer your selfies on glossy paper, you can check out the #Instagang in printed form when their issue hits newsstands this week.